I came across an interesting article while Flickrin’ the other day. 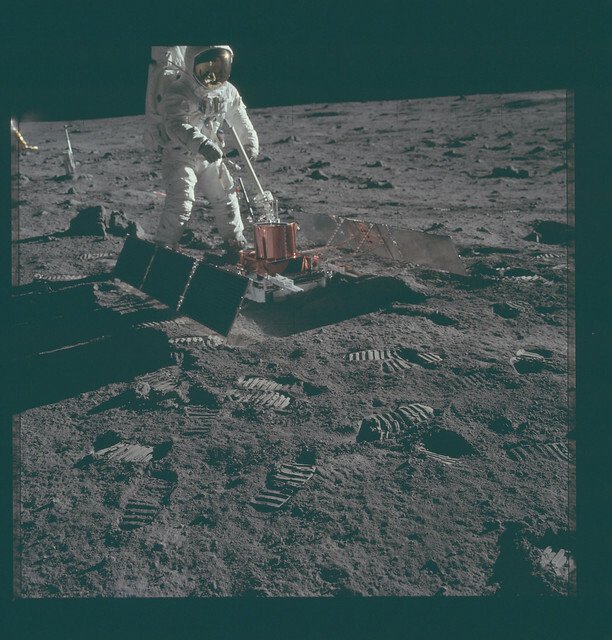 NASA have released an archive of all the Apollo mission photographs that appear to have been taken using a Hasselblad on the Apollo 11 mission. It might seem strange to re-publish this archive and for many the events of the Apollo missions were truly out of this world as was the whole space race alongside the cold war. Interestingly this year some major chain stores in Europe have used the moon as a feature in their promotional videos; John Lewis https://youtu.be/wuz2ILq4UeA; Aldi ; EDEKA which to me has the best narration to express the sentiment of being lonely and he resolves the issue. Although there is little documentation on each photo the archive will give some easy viewing using the slideshow function, personally I walked through the pages using a mouse, this gave some interesting views on the screen as the frames are set out in chronological order. Whole pictures of the surface of the moon, the earth turning; shadows of the astronauts and much more. I included a section of the introductory text relating the project.But worth clicking more to read about the archive creation and view the related images. The Project Apollo Archive was created in 1999 as a companion to my “Contact Light” web site…a personal retrospective of the era of the space race. A subsequent collaboration between the Archive and Eric Jones’ Apollo Lunar Surface Journal led to aquisition over the years of countless historic Apollo and other space history images generously provided by NASA and others for processing and hosting on the NASA-hosted Journal as well as on my site. Contrary to some recent media reports, this new Flickr gallery is not a NASA undertaking, but an independent one, Read more…….